This large tapestry "Romance In The Country" shows a scene from "Noble Pastorale" which is a series of 6 tapestries designed by Francois Boucher, the famous French artist and tapestry designer (1703-1770) who was champion of the Rococo movement of art. He became the head of the Royal Gobelins Manufactory in 1755 and the First Painter of the King in 1765 under King Louis XV. In addition to the more mythical and fantasy based scenes, his works often depicted the lives of nobility and villagers. Here we see a romantic scene of the country where a young couple is enjoying the beautiful surrounds, with others playing music and children playing with goats and sheep. It is an idyllic 18th century pastoral scene depicting life in the French countryside and the life of the villagers in this ideal setting. 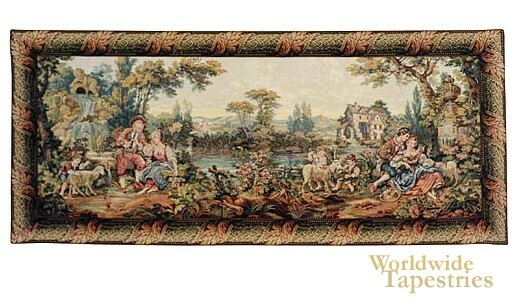 This art tapestry "Romance In The Country" is backed with lining and a tunnel for easy hanging. Dimensions: W 110" x H 48"
Dimensions: W 135" x H 65"